A good day everyone! We can use your help with our project! The current Readme for Hyper DBZ that we have currently isn't the prettiest, so we're aiming to have it redesigned before our next build release. The image above is how we want it to look. What we're asking for is somebody who's kind (and qualified) enough to make a HTML template for us based on that design, a template that we ourselves will be able to edit (changing text and images). Below the example image is a link to a PSD of the template design and also includes the two fonts that were used in it. Any takers? You'll really scratch our backs! When we have a working template, we'll take it upon ourselves (well, I will, most likely) to fill in all the content for each character. A group of layers is hidden in the PSD! That contains the cut-out arrows that will be used in the command descriptions. Does this all sound clear? Any questions or more info needed? Is the top part a list of all characters in the game? Yes it is. You'd click a character to go to their movelist. And should be possible to add more portraits/links. I'm very much out of practice with web building. Years ago I learned enough html, Java, and css to build some pretty nice comic sites. But I seem to have forgotten practically everything I learned. Anyway iirc isn't java a sort of baine of the net? I think I remember having to remove all Java stuff. I might should google again to be sure. Obviously nothing in flash. Anything else should be fine. Is the "Power Mode" supposed to be just like "Special Moves"? I mean, will it be another "collection" of moves? And what about the "Credits"? What does it look like? There wasn't really a big discussion on it so I'm going to tag the main driving forces and summon one of them to make sure you get a correct answer. Sorry for not giving enough info. Honestly I didn't think it throught TOO much, I just wanted to make sure it was more condensed and had less....fluff...than the current Read Me. 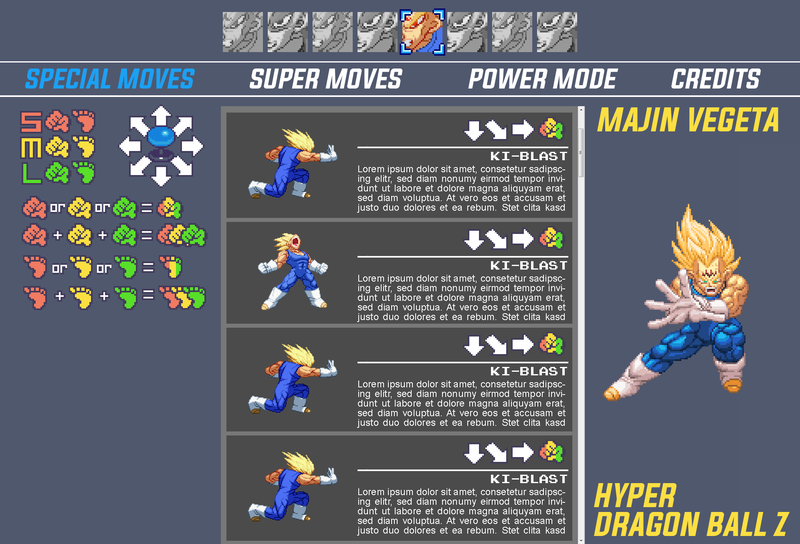 The Power Mode was supposed to be a description each character's Emotion System, but I guess it could also be described under the Super Moves section. Credits would be the tab where all the creators of the character are credited (spriters, coders, contributors, etc. Also I guess relevant links to websites and whatnot). But yeah the actual content isn't that important as we'll be the ones filling that in. Credits should just be a text field I suppose! I reduced the size of every image to about 60% of the original because they looked to big on my monitor, but I can make them bigger if you want. Overall, I think it is ok, if you want me to change anything, just tell me and I'll do it! I just need a bit more info on the "Power Mode" so I can make it easier for you to edit. Make power mode just like the specials. All it is is a unique super that gives new options and things like that can be detailed the same way with the images and text. I did run across some browser-compatibility issues, but I think I solved them all. I tested it on Chrome, Firefox, IE, Edge and Opera, everything seems fine, but if you run into any bug, please, tell me right away! Okay, I fixed mine up today after deleting my post due to finding bugs. Let me know if you need help on laying out the Credits. I also modified the green on the L punch and kick to a Blue. This is due to color-blindness making it difficult to tell the difference between Red and Green. (and is why it's always Red vs Blue in all games). This Help is resolved thanks to sorwah! We've chosen his work to be the main Readme HTML code. Thunderbert, thanks a lot for your effort, but we can only choose one. You'll be credited in the new Readme anyway, if you so choose! Thank you indeed Thunderbert! I think sorwah had beat you in contacting Balth off site. They even hooked up on facebook and fine tuned it together. It's really rare these things get one volunteer. Two is amazing! Thank both of you guys!!! You come through for folks and add a lot of positive to people's hobbies! Two different approaches enter the arena. One may survive. But I give yours mercy. It was fun practicing my web development . 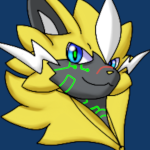 Worked with Balthazar to really touch up my template. Look forward to the full release.